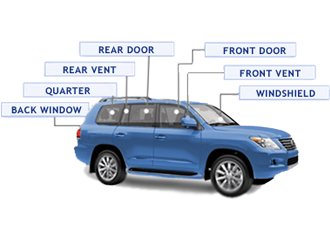 If you are in need of an auto glass provider in Grass Valley, Auburn, Roseville, or Folsom, you should be aware of the various services that we provide. We warranty our work for a lifetime, and will offer an alternative solution to repair a windshield if a replacement is not absolutely necessary. When our repair technician works on your vehicle, we make the best decision as to whether a repair or replacement would be ideal – keeping the safety of the driver and integrity of the driver in mind. We will get the job done right! We will provide you with the highest quality installation because we use only OE or premium materials and certified installers. Windshield Repair – This is perhaps the most common issue that auto glass repair companies attend to; in fact, most auto glass repair companies would rather repair a windshield than replace it entirely. If it is possible, cracks, scratches, stars, etc. can all be repaired in lieu of complete replacement. If the crack runs the whole length of the windshield and seems to be branching out, then perhaps there is no other option than to replace the windshield altogether. Broken Windshields – Just because a windshield is badly damaged does not necessarily mean that a full replacement is necessary. Consult with the technician who will advise you what the best way to handle the situation is. Replacing a windshield is costly for both the customer and the company, and replacements can be more of a hassle. A good auto glass repair technician in Folsom will always find a way to repair a windshield before replacing it. Chipped Windshield – There may be points on the windshield where there may be chips of glass missing. This does not indicate the need for a full replacement. Instead, the chips can be filled in by experienced technicians. Cracks in the Windshield – This is perhaps the most dangerous situation of all, as the crack can spread and branch out, ultimately obscuring vision and potentially causing accidents. A cracked windshield can also become separated from itself, which is why this type of problem needs to be addressed as soon as possible. Scratches on the Windshield – This one is also very dangerous for almost the same reasons. A scratched windshield can blur visibility, which can cause accidents as well. Door Glass Replacement – When your car gets broken into or the kids neighbor throws a baseball through your door glass or backglass, an auto glass company in Auburn can usually come to your home and replace it and clean up the glass without you having to drive around town. Depending on the type of repair or replacement you need, Affordable Auto Glass in Auburn-Folsom will help you in deciding what service is best for your needs. Our staff are reliable, have the necessary skills, and work efficiently. Our technicians have the best equipment for the job, thus helping you get back on the road in the smallest amount of time possible, and we come to you! We were out in Folsom putting a windshield in a mini-van today. The cold weather caused a huge crack. Be sure to get those dings repaired so that you don’t get a crack!